Country music makes major stars of numerous vocalists, from Hank Williams (Senior and to a lesser extent, his son, Hank Junior). Johnny Cash, Patsy Cline and Tammy Wynette to current hitmakers Garth Brooks and Nanci Griffith, but few of country's instrumentalists ever hit the headlines in a similar manner — Chet Atkins (who is part of this story for other reasons), Charlie McCoy, Scotty Moore, and a few other names are internationally known, but these "pickers" (as they're called in Nashville, the world headquarters of country music) are rarely as widely revered as their dynamic talents deserve. With this album, we turn the spotlight on one of country music's most enduring musicians, who for many years has been one of Nashville's premier pickers, piano stylist Floyd Cramer (no, you don't pick a piano, but it is strung, like a guitar, which you certainly do pick). His outstanding talents contributed to numerous very familiar classics of popular music during the Fifties and Sixties, after which he decided to concentrate on live performance as a stage star rather than adding his unique keyboard style to hits which brought great fame to others. 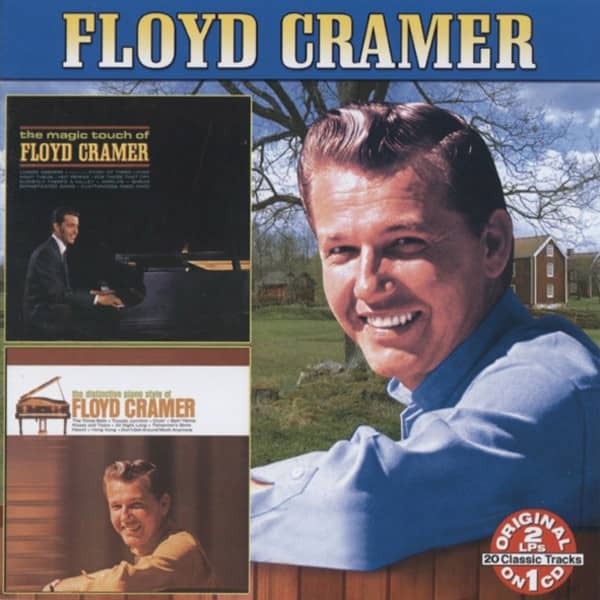 Floyd Cramer was born in Shreveport, Louisiana, in late October, 1933. Shreveport is close to the Texas border, and if the Grand Ole Opry in Nashville is the best-known country music radio show in the world, right behind it is the Louisiana Hayride, spreading the sound of country from Shreveport over a wide area some distance south-west of Tennessee. Elvis Presley meant much more on the Hayride than on the Opry, and Louisiana is as famous for jazz, blues, cajun and R&B as it is for country, so Cramer had been exposed to several musical styles when he started playing piano aged five. He was brought up in a small town in Arkansas where he was the only young musician around (before sax-playing President Clinton, also from Arkansas). Although he didn't enjoy piano lessons, Cramer liked playing the instrument "when I had nothing else to do." By the time he was a teenager, he was such a good player that he decided that music would be his career and when he left school, joined the Hayride. He met Elvis at the Hayride, and played on several of The King's early classics, including 'Heartbreak Hotel' and 'Blue Suede Shoes,' and worked with him on movies like 'Blue Hawaii' and 'Girl Happy.' He also added piano to such classics as Don Gibson's 'Sea of Heartbreak,' Jimmy Dean's 'Big Bad John' and 'He'll Have To Go' by Jim Reeves, and having released his first record in 1952, scored his first hit on his own account in 1958, 'Flip Flop And Bop.' In 1960/61, he had three US Top 10 hits in nine months - 'Last Date' went Top 3, 'On The Rebound' not only made the US Top 5 but also topped the UK chart, and his sympathetic reading of the Bob Wills hit, 'San Antonio Rose,' was his final major hit. He was probably a victim of the twist, a dance craze of the same era which relied more on hypnotic rhythm than on subtlety in the form of Cramer's unique trademark, the so-called 'slip note.' This style, which is instantly recognisable, was refined by Cramer, and is the equivalent on piano of sliding up or down a fret on a guitar. Doing it smoothly on guitar is relatively simple, but doing it on piano requires a deftness of touch which only Cramer seems able to achieve at will. In Britain, 'On The Rebound' became a chart-topping smash because it didn't sound like any other record we had ever heard (and it was American, and therefore a lot more street credible than chart-topping British piano pumper Russ Conway). Even though he'll soon be eligible for his bus pass (or the American equivalent), Floyd Cramer retains his mastery of an instrument he started playing before the Second World War, and that instantly identifiable sound remains as unique as ever. This man is a legend, and his right to be regarded alongside Chet Atkins, Charlie McCoy and Scotty Moore is easy to justify — as you'll hear on this exceptional collection of familiar hits performed in the unique Cramer style. Customer evaluation for "Distinctive Piano Style Of & Magic Touch Of"